A BUBBLING CAULDRON: General Plan Workshop Fun, And More! THE GENERAL PLAN AND FUN, TOO! 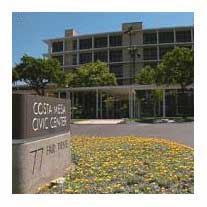 The City of Costa Mesa announced that the next in the series of General Plan workshops - this one a "Visioning Workshop" - will be held next Tuesday, July 23rd on the City Hall lawn. This one is special because it's designed to encourage families to participate and provide their input into the revision of the City's General Plan that is underway now. Costa Mesa residents who attend this particular workshop, which runs from 7:00 to 8:00 p.m. will receive four free tickets to a family movie that will be screened immediately after the meeting. While a parent or adult attends the General Plan Update Workshop, children will be entertained making cardboard-box cars on the nearby lawn. 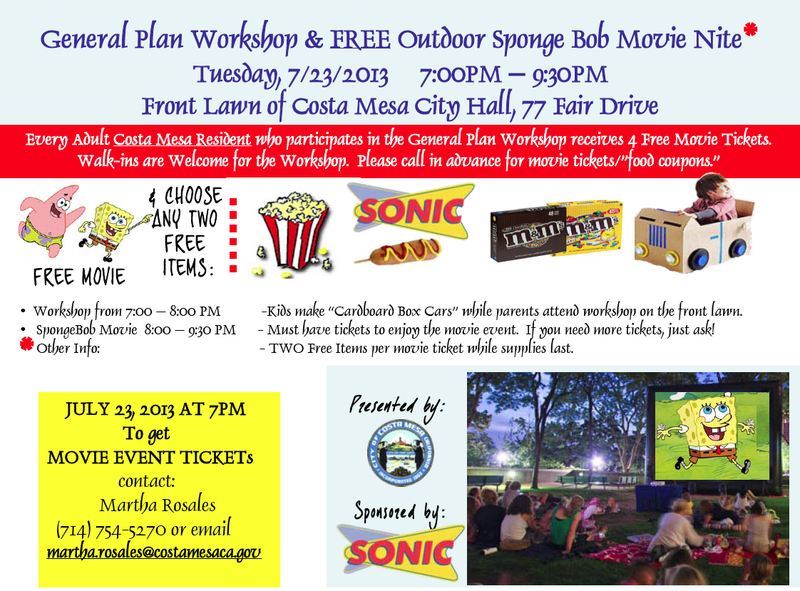 During the screening of "The SpongeBob SquarePants Movie", which will be projected on a giant inflatable screen, free corn dogs from Sonic, fresh popcorn and other snacks will be available. The workshop is a critical part of the General Plan Update process. This particular event is designed to provide residents with children to carve out some time to provide their input on what they think the city should look like into the future. This update opportunity only comes around about once every decade, so it's very important that concerned residents share their vision for our city at this time. Registration is not required for this workshop, but please call in advance for movie/food tickets. 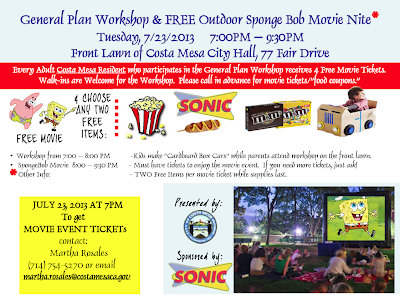 Contact Martha Rosales by July 22nd at 714-754-5270 or email her at martha.rosales@costamesaca.gov. See the flyer below for more information. Click on the image to enlarge it. And since you're here, The City has coupons for reduced admission to the Orange County Fair available in the City Clerk's office at City Hall. Each coupon is good for $2.00 off for up to four (4) admissions and may not be combined with any other offers. The Orange County Fair runs Wednesday through Sunday from now until August 11, 2013. These coupons can help buy a deep-fried, bacon-wrapped pickle or other culinary delights at the Fair. Oh heck yes, since I saw the council meeeting video last night I was looking for an excuse to go. But aren't the Concerts in the Park at the same time? man. I can skip Elvis I guess. Actually, James, you could probably go hear Elvis and STILL make it to City Hall for SpongeBob and a corn dog! The Daily Pilot should advertise the flyer for this workshop and movie. That would help get the word out. The Daily Pilot is usually a few days behind so look for it in the Friday edition. They try but it's hard to get updated or current news from them. how much is the FOOD costing the taxpayers? on top of the party a couple weeks ago? this isn't the water district! will robin leftovers be there? Good questions Doggy bag dude. I got a few questions for you too. Are you still talking about the Mesa Water issues alumni reunion? Didn’t you think it was thoughtful when our host announced they had plenty of food left over and invited guests to fill up the take-home containers? Don’t you hate to see things go to waste? So un-environmental, as Jim Fitzpatrick has taught us all. They were disposing of cool helium balloons, so I got some of those for my grandkids (who had lots of fun with them later) then got in line for a little treat to take home to my hubby. By the time I got to the table all the sandwiches and chicken had been scooped up, but I got a nice little fruit salad and a couple of cookies. I don’t mind that Mesa Water’s guests got some yummy leftovers, why do you have a problem with that? Especially if this is who I think it is, you made out real well! I don’t have a problem with maximizing the fun potential of party balloons before they go off to the landfill, do you? I have a little problem with the hypocrisy I see in your posts. I wasn't there but, yes, it seems like a thoughtful gesture for the host to tell whoever was there to take some food so it would not go to waste. I have problems with offering food in the first place though. You, Wendy and Sandy are three very smart, strong ladies who are threats to the Baugh regime in Costa Mesa. Baugh/councildudes have sent out their attack dog, man of multiple online personalities here to trash you at all costs. You will see your name appear in his comments out of nowhere, trashing you and lying about you. That is what he is paid to do. The greater the threat to Emperor Baugh, the greater the attack from man of multiple online personalities. Who the hell cares what Robin eats, or where? Get a grip, you losers. It’s Ms Leffler to you, Mr doggy bag. Sure, it makes sense for board members to have something to keep their energy up. But hot trays heaping with eggs, bacon, sausage , plus bagels, cream cheese, pastries, fruit, smoked salmon? All for 5 board members and a handful of employees? There was enough for 40, and I was the only member of the public. I had breakfast before I got there, darn. I went home for lunch too soon, I guess. When I came back I found sandwiches, salads, enchiladas and deserts galore, and I was still the only member of the public in the room. ( I did grab a desert, heck, I paid for it) This extravagant spread was inappropriate. It was more appropriate to serve lunch to the well-attended reunion of residents who'd taken the very informative Water Issues Study Classes. Maybe MWD could have been a little less lavish, but at least the food wasn’t wasted. You are right, these are small things compared to the overall Mesa Water budget. As entertaining as you think your little slurs may be, that’s not the important story here. True, some Board members are spending too much on frills, but according to the Register article the worst offender is General Manager Paul Schoenberger. Also true, Director Jim Fisler racks up the highest per diem charges of any director, $4,312 more than any other Board member (MWD webpage). These are not good indications of a conservative respect for ratepayers hard earned money, but the big question is about the big money: Why are they raising our rates when they are stockpiling millions in cash? Ratepayers must get more involved and be vigilant because “those that are faithful in the small things are faithful in the large things”. If Mesa Water managers and directors are not conservative with our money in one area, they won’t be in another. I hope more ratepayers start taking an interest. Robin Leffler: Thanks to you and many others, we're not only watching, but can see things a lot clearer. Thank you. Don't stop. Petty hustlers and hucksters will never overcome your truthtelling. There's reportedly a correlation between the drop in real estate inventory and the rise in Fisler's per diem. If true, does he expect the ratepayers to make up what he might not be making in commissions? Maybe previous posters calling for a boycott of Fisler and Valerie were right after all. Ever notice that Riggy and the other bootlickers seem to always be in the middle of some money-related controversy? You know, doggy bag, I’m having fun with this. Thanks for opening the topic on this thread because I want to draw attention to the Water Department. They need members of the public to get more involved but they have made it very difficult for the public to watch them at work. Board meetings are now scheduled at odd times throughout the week and a lot of business that used to be done at a resident friendly time slot will be pretty much out of the public view. There is still an evening meeting, PLEASE get the schedule and get involved. This is local government too and water prices and practices affect us all. About 4 years ago Jim Fisler and General Manager Paul Schoenberer invited me for coffee (I bought my own coffee) to talk with me about some concern that Jim may have told me something he shouldn’t have revealed from a closed session. I teased him and said, “You aren’t going to charge the rate payers for this, are you?” He said “Of course not!” Well, a few months later I got an irate call from a Mesa Water watchdog demanding “Why were you having coffee with Jim Fisler?” She was looking at a line item for a $207 cup of coffee (his, not mine) billed to the ratepayers as one of his meetings per month. I called him about it and he apologized, but he’s still way out in front for billing the ratepayers the max every month. He’s the only director who does. I appreciate the kind words and that’s what I really want to do, inform and hope people will search out the truth and get involved. -I’m not running for city council altho from the number of attacks on here you’d think some folks are afraid I am. -I don’t advise a boycott of any real estate firm just cause you might not like an agent that works there. I don’t think that’s fair. Also, like him or not, agree with him or not on some issues, Jim Fisler is just a person trying to earn a living like most of us. If you have a reason that would cause you not to want to do business with him or anyone else, then don’t. But be careful about that boycott stuff. Go with an agent you trust and can relate to. Torelli is a hard-charging professional. I have no complaints about any transactions I’ve had with her. Ratepayers must get more involved and be vigilant because “those that are faithful in the small things are faithful in the large things”. Why the silence from you and your cohorts about the Sanitary District? You do know that the same trash company that has a permanent contract, which the Sanitary District Board refuses to put out for bid, donated $10,000 to the reelection campaigns of two sitting Sanitary Board directors, right? We already know why Geoff doesn't say anything, he is good buddies with one of the Board members. What is even more shameful is Geoff suggesting that there is malfeasance in the award of a contract to Ware Disposal for city trash - he suggested that we look at the campaign donations - while silent on the buy-off at Sanitary. sounds like fisler is the hardest working of the directors judging by the number of meetings he does. I did a public records search a couple years back concerning another director's meetings and received a list of meetings. Fisler not only got paid for 10 meetings per month he averaged about another 5 unpaid per month above the 10, 62 unpaid meetings during that year actually. that does not sound like working the system but more like doing a lot of work. and all directors get paid for meetings per state law, some just work harder. they should just get paid a flat amount/mo. and it would be no news. it looks like they get paid 207/mtg. while sanitary gets 221/mtg. hmm..
water district meetings not at odd times. 6 pm on second Thursday. Agree with Robin that penalizing Valerie for what Fisler does or doesn't do is unfair. I'll have to think about the idea of boycotting Fisler though. IF he's doing things in town in the best interests of a political group instead of the ratepayers, why should anyone do business with him? There's a little bootlicker who wants to talk about the San District forever and ever. He can't and won't let go. He has one line, one mantra, and we'll be subjected to it until the Native Americans return to Fairview Park. Don't kid yourself. Valerie was right there at Mensinger's fund raiser as well as the rest of their fundraisers. She's one of them. However, if you are going to boycott, at least do it because of her politics, not his. Pay the Man, sorry, but when Fisler calls to set up coffee, then charges $207.00 for doing that, its not a meeting, its pathetic. He is the one that set it up due to his own error. Why should anyone pay $207 for him to correct his error? That is just ridiculous. I'm sorry Val is getting caught in the middle but I cannot support anything this guy says. He thinks the residents are his payday.